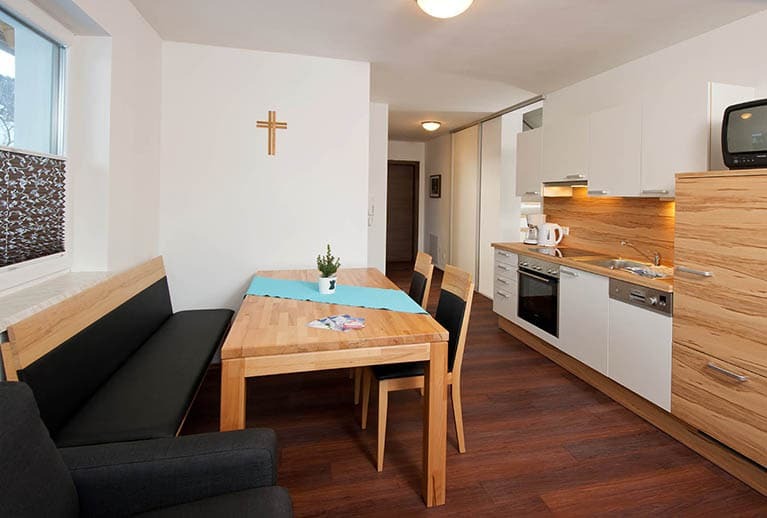 A wonderful holiday in Radstadt awaits you – choose from our two modern, well-equipped holiday apartments sleeping 4 – 6 persons. Relax after an enjoyable and eventful day in the private sauna in each apartment. Our Chalet Haus Kaspardörfl is situated in an idyllic, prime location on the outskirts of Radstadt heading towards Obertauern, in the Salzburger Taurach Valley. The Radstadt ski area in the Ski amadé region plus the Obertauern ski area are just a short drive away by car or free ski bus. The ski bus stop is right nearby. 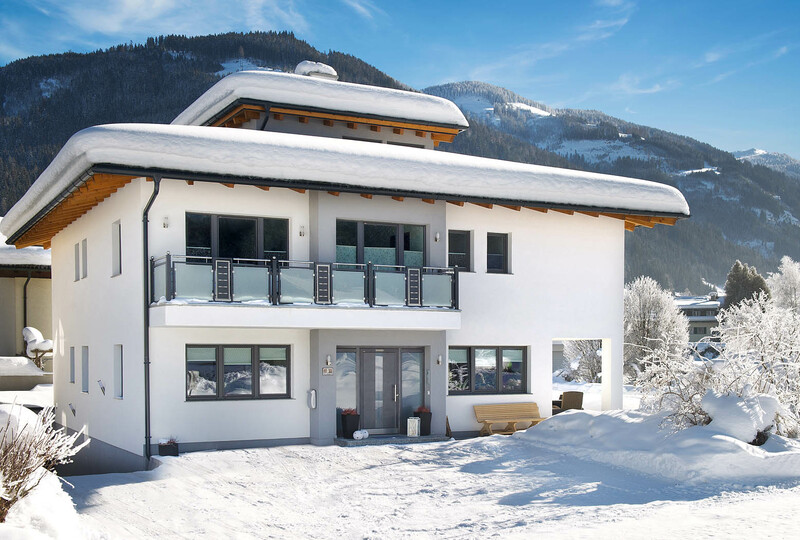 We look forward to welcoming you to our holiday chalet in Radstadt, Salzburger Land. Enjoy your summer and winter holiday with your family or friends in our two holiday apartments in Radstadt. The cosy, modern furnishings entice guests to relax and feel at home. A highlight is the private sauna in each apartment. Wonder at the spectacular view from the balcony too. Prices in Euro. The prices stated are per apartment per night for stays of 2 nights or more, excl. end of stay cleaning fee (€ 40,00), incl. 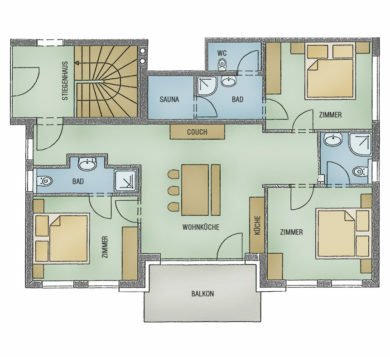 resort taxes, bread roll delivery service, underground garage parking space, private sauna, wi-fi and ski boot dryer. Subject to change, errors and omissions excepted. Free wi-fi internet is available in the apartments. We are pleased to offer a bread roll delivery service for our guests. We’re happy to provide cots and highchairs for our youngest guests. Please let us know your requirements in advance. The apartments are equipped for allergy-sufferers (suitable bed linen, no carpets). Smoking is not permitted in our Haus Kaspardörf. Pets are not permitted in our house. Resort tax is included in our apartment prices. To confirm your reservation a deposit is required. The remainder should be paid in cash. All prices are in EURO. Subject to change. Errors & omissions excepted. Prices in Euro. The prices stated are per apartment per night for stays of 2 nights or more, excl. end of stay cleaning fee (€ 40,00), incl. 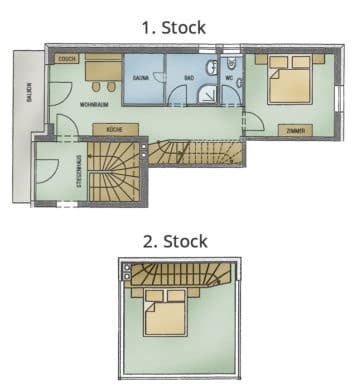 resort taxes, bread roll delivery service, 2 underground garage parking spaces, private sauna, wi-fi and ski boot dryer. 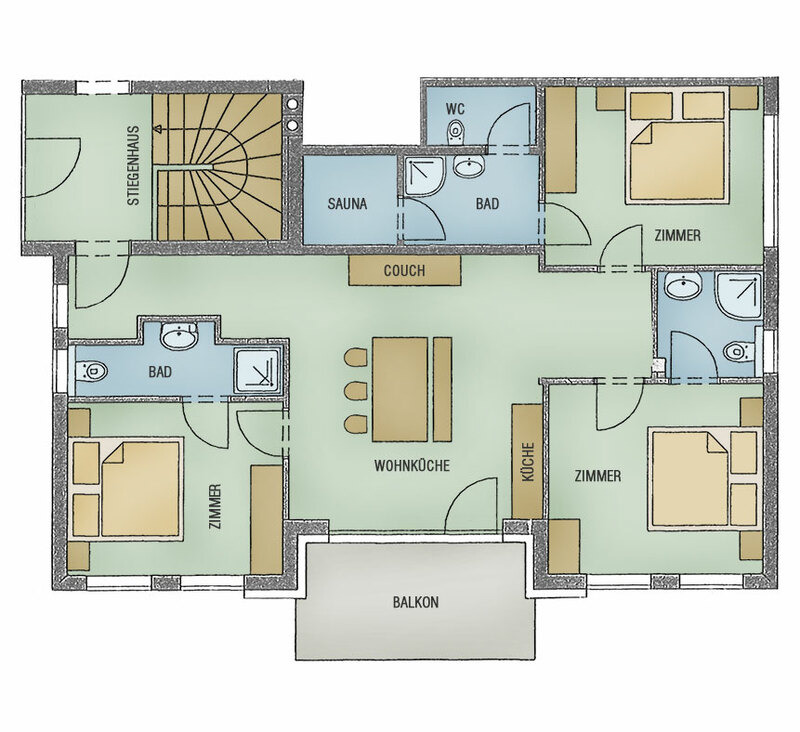 In winter high season our Apartment Taurach can only be rented for 6 persons. Subject to change, errors and omissions excepted. Our apartments are suitable for allergy-sufferers (suitable bed linen, no carpets). Smoking is not permitted in our Haus Kaspardörfl. 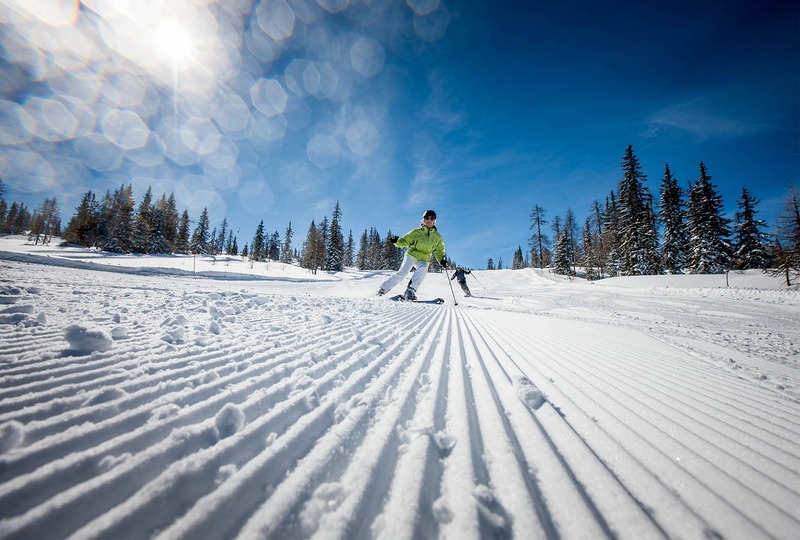 The picturesque winter sports resort of Radstadt is a real winter paradise. 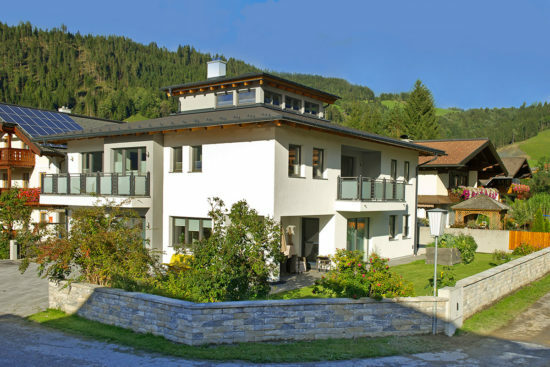 We are situated in the heart of the Salzburger Sportwelt in the Ski amadé. The ski areas of Radstadt, Obertauern and Reiteralm can all be easily reached on the free ski bus. The ski bus stop is just a few minutes walk from our house. 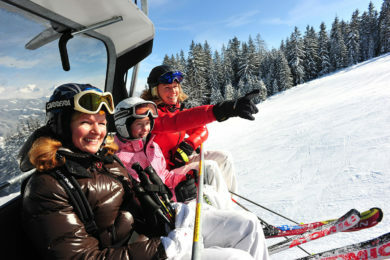 The Radstadt-Altenmarkt ski area is part of of the largest ski association in Austria, the Ski amadé. Whizz down the slopes where ski stars such as Roswitha Steiner, Andreas Schifferer or Hannes Reichelt learnt to ski. 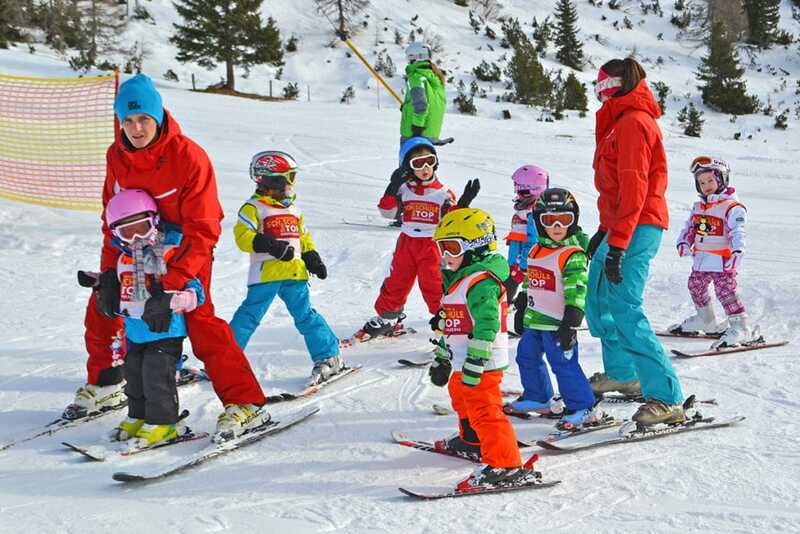 In Radstadt you’ll find a number of sports shops, offering ski rental and ski service. 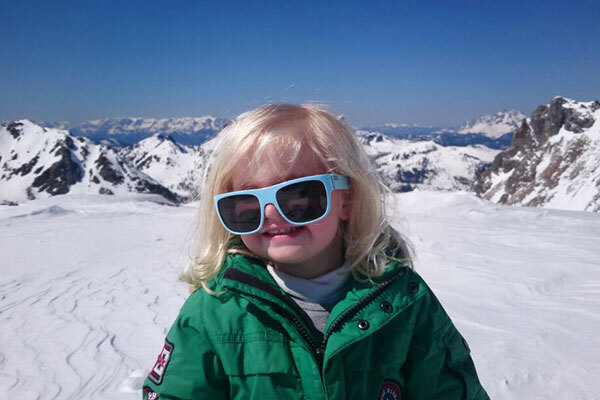 The Ski School Radstadt offering ski and snowboard lessons (private tuition and group instruction) is right by the Königslehen lift. 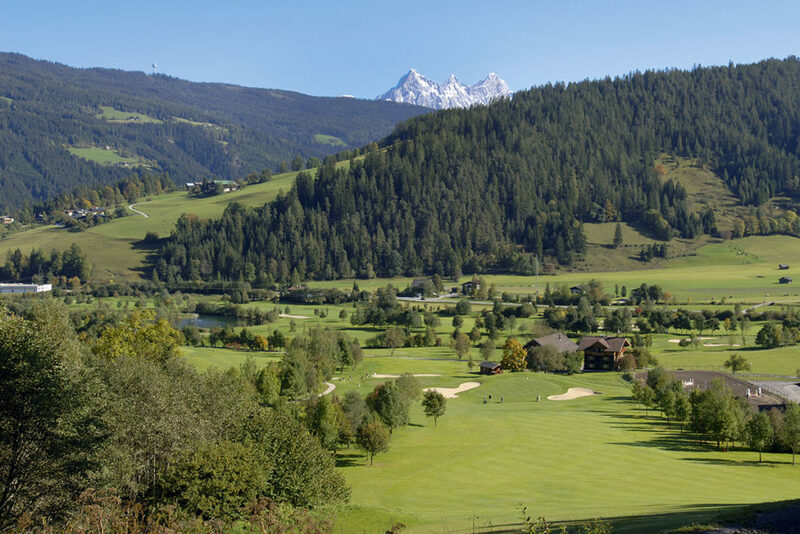 The 180 kilometres of well-groomed cross country trails in the Salzburger Sportwelt make the hearts of cross country enthusiasts beat faster. The cross country trail access point is just 100 m away from our Haus Kaspardörfl. The floodlit, 6 km long toboggan run is open daily and can be used during the day free of charge with your lift pass. Tuesdays and Fridays the toboggan run on the Königslehen lift is floodlit and night tobogganing is on offer. Walk from resort to resort through romantic, snowy forests – 20 km of cleared footpaths allow you to savour enjoyable moments in the wonderfully beautiful snow-covered mountain landscape around Radstadt and lead right past our house. All visitors, young or old, can enjoy a wealth of spa, sport and action facilities in the spa – just 8 km away. 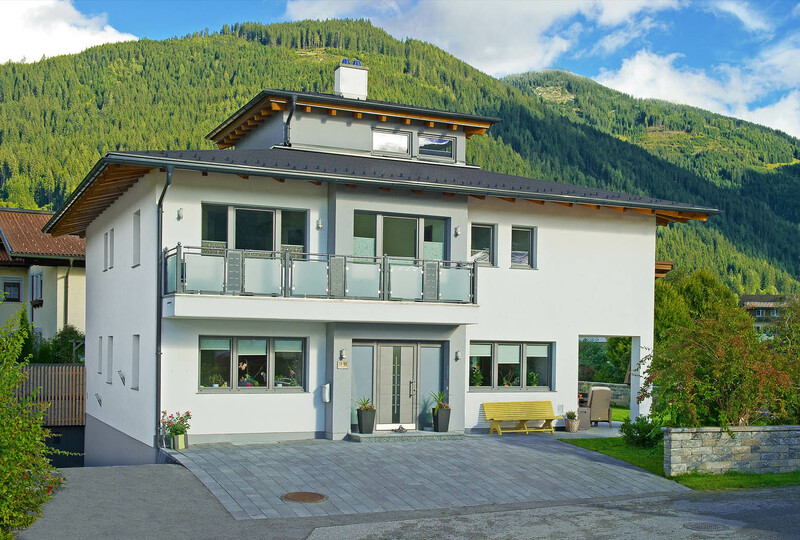 Take a dip in the relaxation indoor and outdoor pools enriched with salt from Bad Ischl or unwind in the spacious sauna area with a variety of themed saunas. 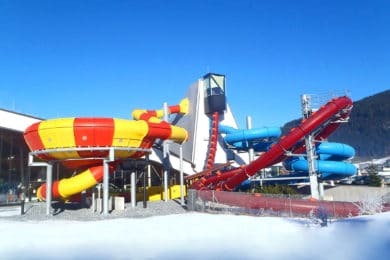 The wave pool, the single loop water slide with rocket launch, black hole and funnel water slides ensure fun and thrills. 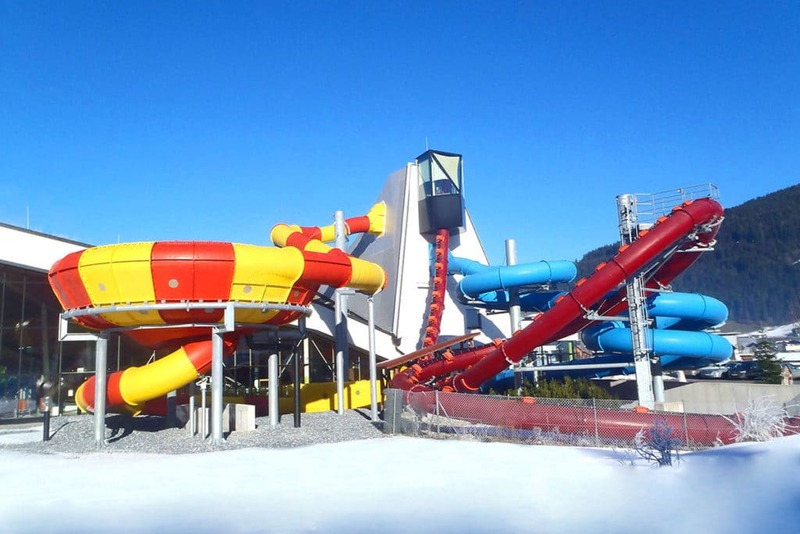 Train in the sports pool with diving boards and water climbing. 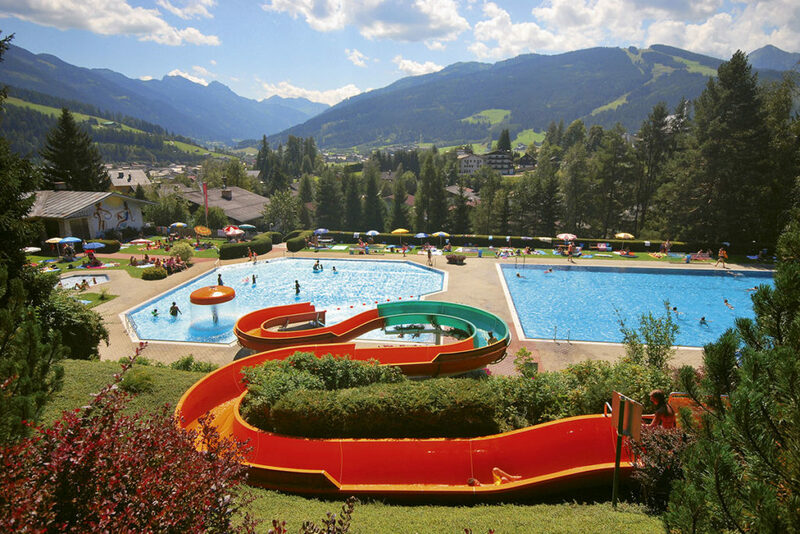 There’s a separate toddlers’ pool with slide for younger guests in the Adventure Thermal Spa Amadé. The resort of Radstadt has lots to offer in summer too. Our picturesque and historic town is particularly suitable for an eventful family holiday. 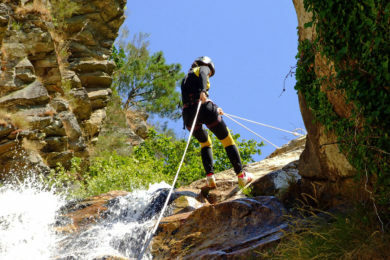 There are a wealth of sporting and leisure activities available. 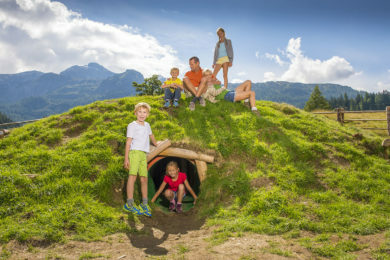 Plus Radstadt makes the perfect base for visiting sights & attractions in the whole of Salzburger Land. The mountains around Radstadt in picturesque Salzburger Land offer a wide variety of footpaths and mountain tours for all ability levels. 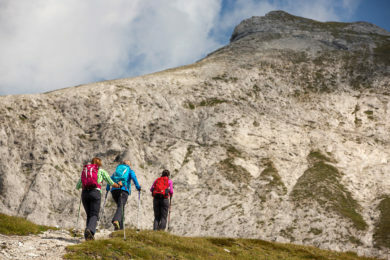 Everyone from gentle walker to mountain climbing enthusiast will find a suitable tour. 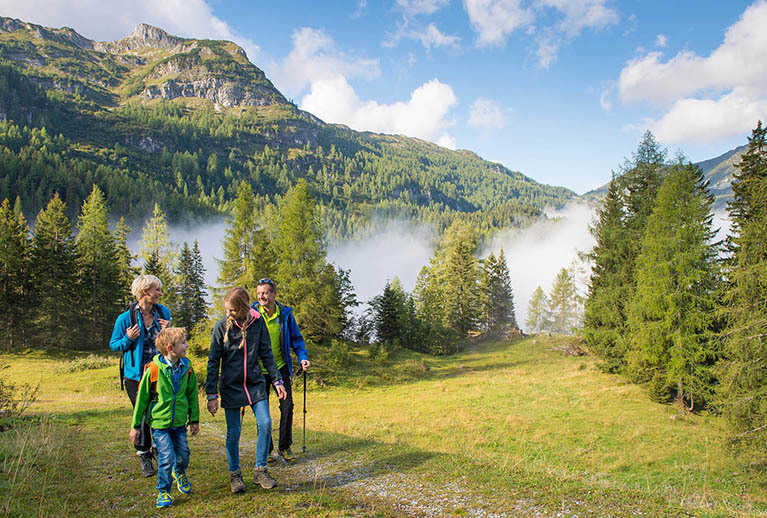 A hike on the Rossbrand is recommended for families – the panoramic view will amaze you. 50 m away from Haus Kaspardörfl. 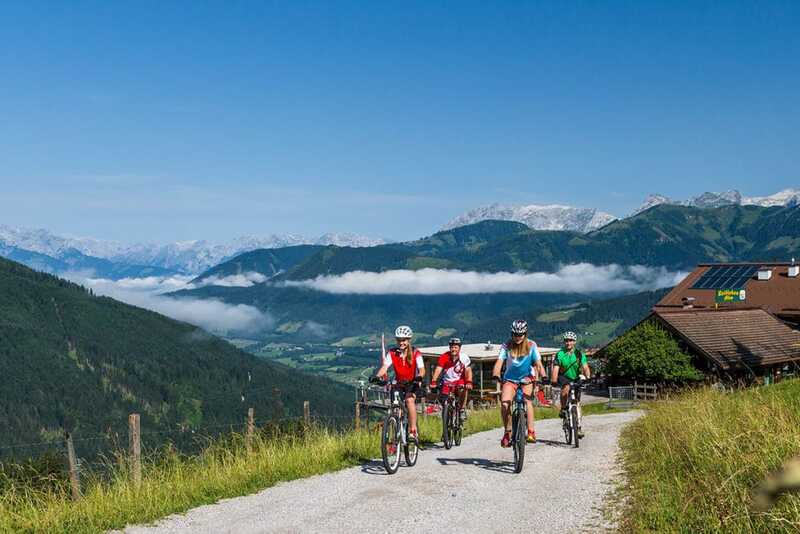 Radstadt offers guests an ideal access point to th Enns Cycle Path for your cycling tour from Salzburger Land to Enns. For mountain bikers there are great routes of varying lengths and levels of difficulty for exploring the mountain countryside. The cycle path is 500 m away. In addition to the Thermal Spa Amadé in Altenmarkt im Pongau, you’ll find the Alpine Outdoor Pool in Radstadt. 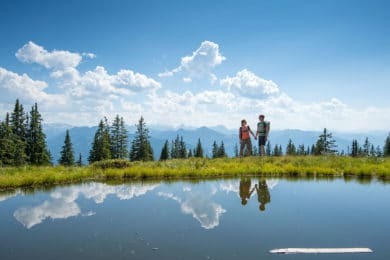 Bathing lakes are nearby in Flachau, Eben and Pichl. There’s nothing in to stand in the way of an enjoyable time swimming on your summer holiday. The Golfclub in Radstadt offers a 27 hole golf course with a unique golf cable car. Try out your first swings on the driving range or take part in one of the golf tournaments. 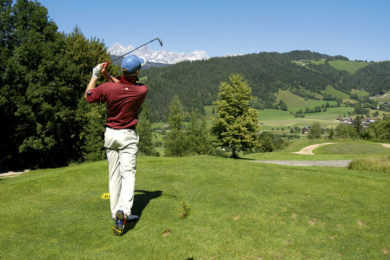 The golf course is situated just 1.5 km away from our house. If you’re looking for thrills and spills on your summer holiday there are plenty of adventure sports to choose from, such as canyoning, kayaking, rafting, paragliding etc. The ACS Alpincenter is our reliable adventure organiser in resort. After the contact form has been submitted, the aforementioned information will be processed by the company which bears responsibility for complying with data privacy regulations, including Haus Kaspardörfl, Christiane Mayrhofer, Kapellenweg 1, A-5550 Radstadt, info@kaspardoerfl.at, for purposes of processing your request, with your expressed consent indicated by submission of the form. The information will be further processed for purposes of direct advertising, which is commensurate with the original processing purpose, and upon the same legal foundation, until rescinded. There exists no legal or contractual obligation to provide personally identifiable information. The only consequence of not providing information will be that you are not able to transmit your request and we will be unable to process such a request. Such information will not be shared with other recipients. You have the right to revoke your consent in writing at any time, which shall not affect the legitimacy of our having processed said information until such time as consent is revoked. You have the right to revoke your consent to the use of your personally identifiable information for purposes of direct advertising in writing at any time. In the event of revocation, your personally identifiable information will no longer be processed for purposes of direct advertising. You have the right to information about, as well as correction, deletion, restriction of processing and transferability of your personally identifiable data, as well as the right to lodge complaints with the oversight authorities (Austrian Office of Data Protection, Wickenburggasse 8, 1080 Vienna, dsb@dsb.gv.at). The location of our Haus Kaspardörfl in Radstadt is shown by the red symbol. The GPS co-ordinates for your sat-nav (UMT) are: lat: 47.3693174, long: 13.4841042. 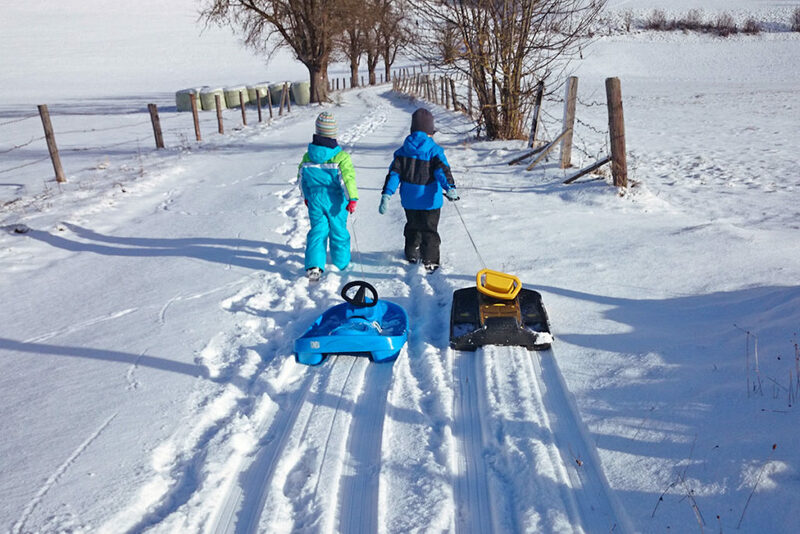 Please find out about the current traffic situation in Austria, before setting off, so you arrive safely at Haus Kaspardörfl. Please note that a motorway toll sticker is required for travel on Austrian motorways. Radstadt is a mainline railway station. Onward journey by bus and taxi. Salzburg Airport “Wolfgang Amadeus Mozart” is situated approx. 70 km away. The following local taxi firms and shuttle transfers are avialable for your arrival and departure journies.